Nancy Furstinger is best known for the series From the Brink about saving endangered animals, and she continues the important work with this book. Henry Bergh, a product of a wealthy and well educated family, was moved to action. He became the founder of the American Society for the Prevention of Cruelty to Animals (ASPCA) and his work was also expanded to protecting children. When Bergh died in 1888, the idea of protecting animals and children was commonly accepted. I think this would be an excellent choice for a library. Henry Bergh was a man ahead of his time. In the nineteenth century, cruelty to animals was deemed somewhat acceptable, and ethical treatment was not a common cause of activism. His biography, which draws connections to more notorious figures of the day, including Louisa May Alcott, Henry Wadsworth Longfellow, and P. T. Barnum, is a vivid example of life in New York City before the turn of the century. Intermittent color illustrations enhance the text, while Bergh himself, eccentric, devoted, and tireless, will intrigue young readers with his compassion for creatures with no voices of their own. Tackling the life of Henry Bergh (1813–88), the founder of the American Society for the Prevention of Cruelty to Animals, Furstinger provides a satisfying account of an interesting, albeit little-known, figure whose contributions to animal and human rights were substantial. Furstinger creates tension as she describes the vile conditions of animal treatment in the United States and worldwide in the mid-to-late 1800s. VERDICT This suitable biography about a somewhat obscure figure will find many interested readers and is unlikely to duplicate existing collection offerings. 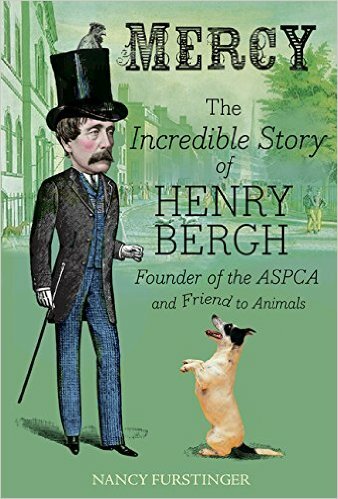 From a dramatic opening involving a dogfight through the final chapter detailing the current efforts of the ASPCA, this well-researched biography of the organization’s founder, Henry Bergh (1813–1888), contains abundant information illustrating the evolution in attitudes about the treatment of animals. Through vignettes highlighting a range of animals—horses, dogs, sea turtles, cows, pigeons, circus elephants—Furstinger (The Forgotten Rabbit) demonstrates the scope of Bergh’s anti-cruelty efforts. Furstinger is a thorough documentarian, and her focus on specific scenes (Bergh regularly accosted offenders in the street, often arresting them) makes for a dramatic and absorbing account.